Maybe it’s old news to you, but I recently downloaded the Mathematics Add-In for Word and One-Note (download from Mircrosoft for free, right here). It works with Microsoft Office 2007 or later. It’s a super quick and easy installation–doesn’t require a reboot or anything. I was even able to install it at work on my locked-down limited-permissions account without needing administrative privileges. I’m impressed with its ability to graph, do calculations, and manipulate algebraic expressions using its computer algebra system (CAS). It’s not as powerful as Mathematica or my TI-89, or even other free CAS like WolframAlpha or Geogebra (yes, Geogebra has a CAS now and it’s not beta!). But I like it because (A) my expectations were low and (B) it’s right inside Microsoft Word, and it’s nicely integrated into the new equation editor, which as you know, I love. Here’s some sample output in word format or pdf (the image above is just the first little bit of this five-page document). All of the output in red is generated by the mathematics add-in package. In this document, I highlight some of it’s features and some of it’s flaws. The graphing capabilities aren’t very customizable. And the mathematics is a bit buggy sometimes. All in all, despite its flaws, I highly recommend it! It’s really handy to have it right there in Word. This entry was posted in Calculators, Math Resources, Microsoft Equation Editor, Technology by Mr. Chase. Bookmark the permalink. I downloaded it. I got a “Mathematics” tab in Word 2010. 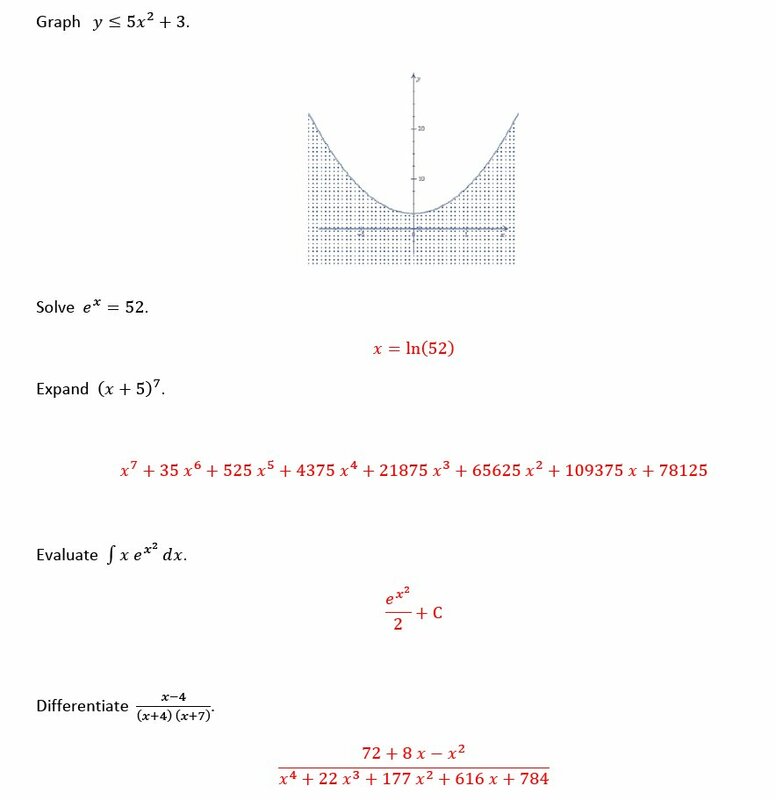 But the “Equation” option (it looks like a pi) that creates what the documentation calls a “Math Zone” stays grayed out. What am I doing wrong? A YouTube video that shows what to do (I’m not proud; I’ll get help anywhere) shows it not grayed out, and how clicking on Equation opens a box in which to enter an equation. Hints? Hmm…that’s weird. So it sounds like the new Mathematics add-in isn’t necessarily the problem. You haven’t ever even been able to input equations with the new equation editor? I think you’re talking about the correct button on the ribbon (the pi button). The way I usually launch the equation editor is by pressing Alt+ =. You could see if that works. Seems like we need to get your equation editor working before we can even think about the mathematics add-in. But not automatically a part. Here’s how to get it activated. Open any document. Go to File | Info | Compatibility Mode. At that point you have the choice of making just this document mode “compatible” or all future docs too. Select all future docs too. Now the equation editor that’s built in will work in all docs old and new, and so will the Mathematics tab add-in that you mention. I have it working now. The downside is that Compatibility Mode automatically reformats all documents according to Office 2010 requirements, even if they are (were) *.doc files instead of *.docx files before opening. So editing equations in older *.doc files requires “bringing them forward” into the new format (even if only to modify an equation, and even if the document is then saved back out as a *.doc file, not as a *.docx file). Unlike IBM back in the 1950s through 1970s, where a corporate policy of backward compatibility of all software and hardware made customers happy, Microsoft takes great delight in obsoleting all previous hardware and software to keep us buying new stuff. Oh, right, of course! I should have thought of that. Compatibility mode will throw you off. Should work without any effort as soon as you are NOT in compatibility mode. I can actually simultaneously use the new equation editor AND the old equation editor in the same document. I have to go to Insert > Object > Microsoft Equation 3.0. It works fine, and I’m using Microsoft Office 2010. In order to use the Mathematics Add-In, your equations have to be in the new format. You’re right that they should have made it easy to convert old equation 3.0 stuff to the new format. I think it IS possible if you own the not-free Microsoft Math program. Double-click the “Default” value in each key and change “C:\WINDOWS\system32\mscoree.dll” to your correct system drive letter. Then restart Microsoft Word or Microsoft OneNote and the add-in should work. That’s a helpful tip. I didn’t run into this problem, but it sounds like quite the annoyance. Thanks for bringing it (and the solution) to our attention! This add-in does not work with Onenote2007. The explanation is quite misleading. The add-in is called “Microsoft Mathematics Add-in for Word and One-Note” and I didn’t think very hard at all about one-note, since I’m not a user. It does work with Word 2007 (I know because that’s what I’m running on my home computer), but you’re right, I just checked the documentation, and apparently it’s compatible with One-Note 2010 and beyond, but no earlier versions. Sorry about that! Thanks for catching my error. Not sure if I can help. I don’t own Microsoft ON 2013 and haven’t tried the add-on with it. It seems clear from Microsoft’s documentation that it should work. It just defies me how anyone can call Mathematics simple to use. I have yet to work out how to make it actually do a calculation on the most fundamental formula like the area of a circle. but no it cant even do that. It’s no matlab or mathematica or maple, that’s for sure! It’s cute, and it has a few little features, but in general I agree with you. It’s pretty useless and I don’t use it. But it did surprise me a bit because, like I said, it’s a free add-on from Microsoft that works inside of Word. It must have a little brains underneath because it has a computer algebra system. It’s still clunky and needs a lot of work though! Thanks for this great information, Constantinos. I think this will be helpful for readers!